Since returning home from our holiday, we have been trying to eat well in an attempt to lose the unwanted Christmas gift of a couple of extra kilos. There are still times though when we do feel like something a little special, and these cookies fit the bill. I’ve been giving Donna Hay’s Modern Classics 2 a bit of a workout over the past week. It had been awhile since I’d sat down and really read through it, and there have been quite a few recipes that have jumped out at me to try. As always, I have made a couple of substitutions and additions to the original recipe. To start with I reduced the sugar content, and used wholemeal spelt flour instead of plain flour. I also just used what I had in the pantry, the recipe suggest 1/4 cup dried apricots and 1/4 cup dried apples – both chopped and 1/4 cup sultanas. 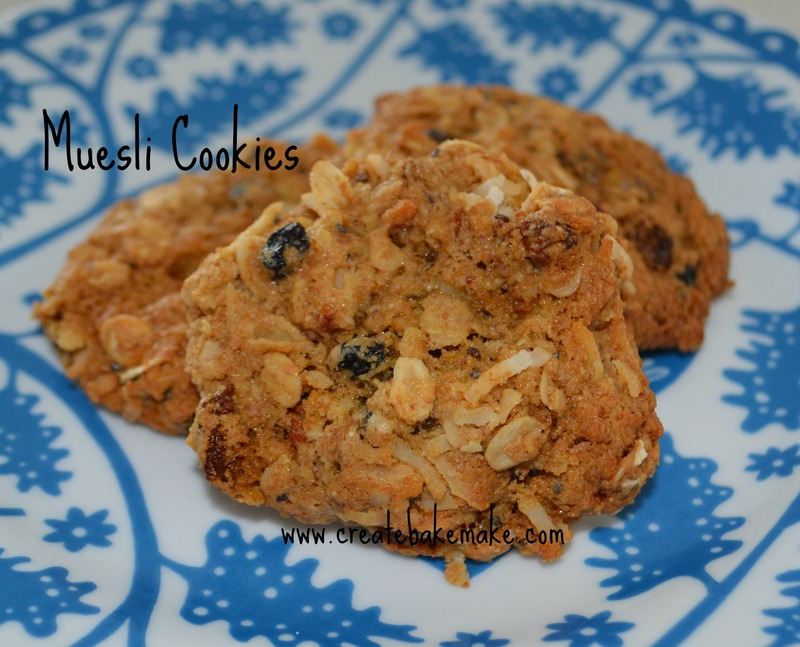 I debated whether to add the malted milk powder, but went along with it and I ended up with a yummy, chewy biscuit – which I do love. As always my big boy was happy to be a taste tester and has also given them his tick of approval. * Beat together the sugar, butter and egg in a bowl until smooth – if using rapadura sugar you will see some small sugar crystals throughout the mixture. * Add all other ingredients and mix together until combined. * Roll tablespoons of the mixture into balls, place onto baking trays and flatten slightly. Make sure you leave room for the cookies to spread. * Bake for 15 minutes until beginning to brown on top – cool on trays for 5 minutes before transferring to a wire rack. This entry was posted in Baking, Cookies and tagged Chia Seeds, Currants, Donna Hay, goji berries, Muesli Cookies, Rapadura Sugar, Wheatgerm, Wholemeal Spelt Flour by laurenm83. Bookmark the permalink. I hope you enjoy them, let me know how they turn out!